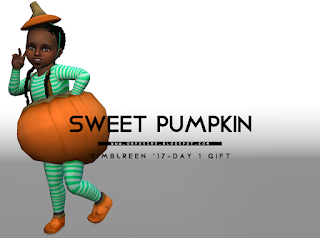 As a lot of you know, around October 26-29th simmers like to participate in an event called Simblreen. To put it short, it's like trick or treating for cc, stories, etc. I myself decided to participate this year and handed out different gifts for each day. Since my gifts were only available on that day, I know some of you may have missed a treat or two. So here's where I make it up to you by including all of my Simblreen treats right here on this page. I hope you all enjoy and if you'd like to know more about the event, check out the Official Simblreen Tumblr Page.